Provost Anthony C. Masi gave Senate an overview of McGill’s financial situation on Feb. 18, that predicts budget cuts of 2 to 3 per cent on average for academic and administrative units, respectively, and a deficit in the next fiscal year of about $14 million. Provost Anthony C. Masi gave Senate an overview of McGill’s financial situation on Wednesday that predicts budget cuts of 2 to 3 per cent on average for academic and administrative units, respectively, and a deficit in the next fiscal year of about $14 million. For the current fiscal year, which ends April 30, McGill’s finances are in relatively good shape, Masi said. That’s largely thanks to cost-cutting measures implemented last fall, and to a $15-million contingency fund set aside last April in case the provincial government made deeper cuts to post-secondary education spending. “We took some bitter medicine when we did the first round of cuts” last year, Masi said, but because of this approach, McGill’s FY2015 operating deficit is likely to be roughly $7 million – still not a balanced budget, but impressive, given the $20-million in mid-year cuts imposed by the Quebec government. “We predicted the cuts and we prepared accordingly,” Masi said. As a result, “we’re able to navigate better than most [Quebec] universities because we haven’t shied away from taking difficult decisions. 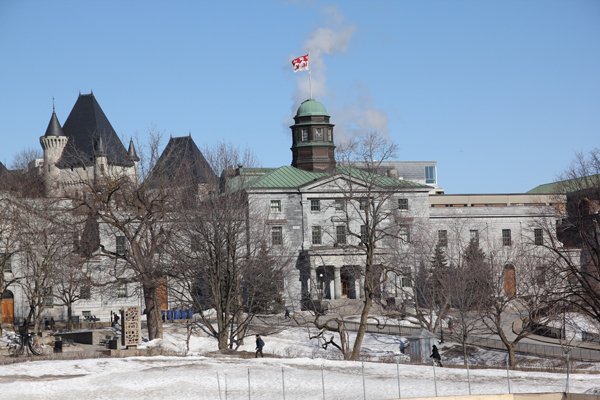 As well, McGill’s spending restraint has left the University well-positioned to honour its salary commitments to all employees, at a cost of approximately $20 million in FY2016. The full extent of those cuts likely won’t be known for some time. The government will likely provide preliminary indications about funding levels sometime in May – about a month after McGill has to present its budget for the year to the Board of Governors – but definitive funding numbers won’t be provided until the fall, half-way through the fiscal year. To help safeguard the University’s finances through an uncertain year, and in anticipation of a fresh round of government cuts, Masi announced the following new cost-saving measures – together, they’ll reduce McGill’s expenses by approximately $16 million. Barring deep new unforeseen cuts, Masi said he expects the FY2016 budget to be part of “a platform that will allow the university to balance its books within five years.” He and Principal Fortier also pointed to some possible causes for optimism on the horizon, such as potential changes to Quebec’s university funding model in FY2017, and low interest rates that make McGill’s debts easier to manage for the time being.